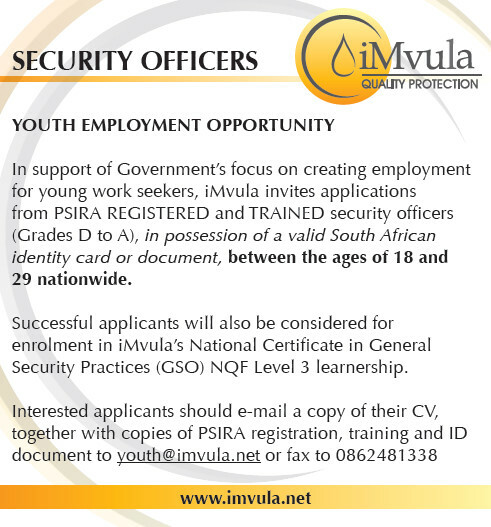 One of the leading security services providers in South Africa, iMvula Quality Protection, is inviting applications applications from young South Africans between the ages of 18 and 29 years old to apply for their security officer opportunities available within iMvula Quality Protection operations nationwide. Applicants are required to be trained in Grade A, or B, or, C, or D and be registered with PSIRA. Successful applicants will be a considered for a learnership which will culminate in a National Certificate: General Security Services at NQF Level 3. Closing date: Unspecified. Advertised 2/7/2014.